Samsung Galaxy S9/S9+ pre-orders have just kicked off in the United States, so what better time to get yourself an older flagship. As expected, the Galaxy S8 (and the Galaxy S8+) is on sale at Amazon for a limited time. And it's about time since the Galaxy S9 costs just $720 at T-Mobile and the unlocked Galaxy S8 (64GB) that Amazon is selling has a slightly higher $725 price tag. Fortunately, you can get it now for just $600 if you don't want to put in the extra $120 for the new Galaxy S9. The unlocked Samsung Galaxy S8 available at Amazon comes with US warranty, so you won't have to worry about that. Also, it should be compatible with all US carriers, including CDMA network operators like Verizon. If you're into bigger phones, Amazon has the Galaxy S8+ on sale as well, but you'll have to pay a lot more if you want it. 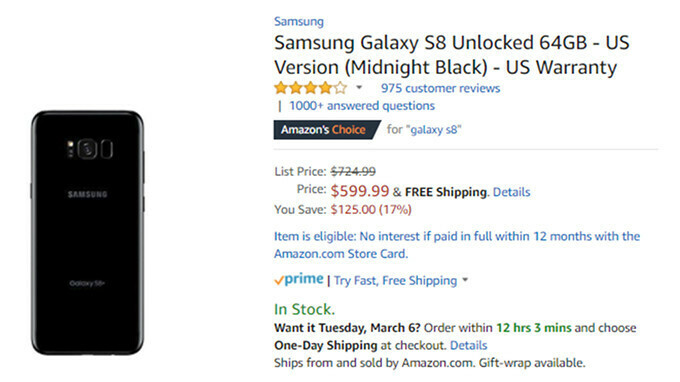 The unlocked Samsung Galaxy S8+ can be had for no less than $725 (usually $825) on Amazon, about the price of a Galaxy S9. Keep in mind though that except T-Mobile, the other US carriers sell the Galaxy S9 for a lot more. For example, AT&T has it priced at $790, while Verizon offers the flagship for $800. wish there will be an unlocked version of Galaxy S9 Active! So... Where it puts the newly launched Galaxy A8? Something tells me that Samsung make too many phones! J Series, A Series, S Series, W Series, On Series, Active Series etc. Almost 2 dozen phones in its line-up! And half of them probably won't get any updates! Keep it simple. Like Apple, if I dare say! G'Day! And even in those series they have dozens of sub series smartphones like j2, 3, 5, 7 than those sub series have their own sub-sub series like pro, pop, prime, nxt, 2016, 2017, 2018, hell, wtf and what not.